This is the extended and updated version of the original article from 2000. This overview is compiled from Michael Armstrong’s book Armstrong’s Handbook of Human Resource Management Practice. Additional information has been added. It intends to give a brief overview on the most important concepts and theories of motivation. Direction might point the way, but effort is what establishes momentum, and persistence determines how far the change is carried (in time as well as in magnitude of outcome). (from Client-centered Direction) Hence, Arnold’s 3 components are suitable to describe the level of motivation a person or a team shows. This concept does not give any reasons for motivation. In other words: Intrinsic motivation comes from a person’s internal desire to do something. Reasons may be that a particular activity gives him or her pleasure, helps to develop a particular skill of seems to be the right thing to do in moral / ethical terms. Extrinsic motivation is generated by external factors that are less related to the particular task. All Needs theories focus on specific needs people want to satisfy. There are several theories that explain motivation as a result of these needs. The underlying concept is the belief that an unsatisfied need creates tension and a state of disequilibrium. To restore balance, a goal is identified that will satisfy the need and a behavior pathway to this goal is selected. All behavior is motivated by unsatisfied needs. People will be better motivated if their work experience satisfies their needs and wants. Needs theories distinguish between primary needs, such as food, sleep and other biological needs, and secondary psychological needs that are learned and vary by culture and by individual. Higher-order needs provide greater motivation. Different people may have different priorities. The theory helps managers to identify which particular needs are relevant for employees and thus to determine appropriate motivators. 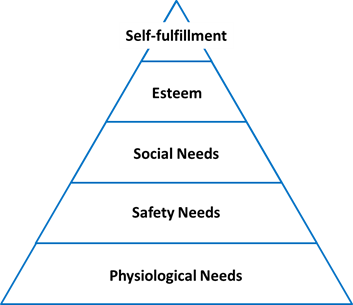 The hierarchy of these three groups of needs may differ from individual to individual. Hence, there are different motivators depending on a person’s high-priority needs. There are some factors that result in satisfaction and some factors that just prevent dissatisfaction. According to Herzberg, the opposite of Satisfaction is No Satisfaction and the opposite of Dissatisfaction is No Dissatisfaction. Value, instrumentality (belief that if we do one thing it will lead to another), expectancy (probability that action or effort will lead to an outcome). Strength of expectations may be based on past experiences. Motivation is only likely when a clearly perceived relationship exists between performance and an outcome that is seen as a means of satisfying needs. Motivation and performance are higher when individuals are set specific goals. Goals have to be difficult but accepted. Feedback on performance allows the individual to track how well he or she is doing in relation to the goal. Participation in goal setting is important – goals need to be agreed. As long as they are accepted – demanding goals lead to better performance than easy goals. Individuals are not passive receivers but responders. They seek to reduce uncertainty by seeking control about factors influencing rewards. Management initiatives about motivation will only work if they make sense to the people in terms of their own values and orientation. This is the article in which Maslow first presented his hierarchy of needs. It was first printed in his 1943 paper “A Theory of Human Motivation”. Most people believe praise, appreciation, and compliments are great ways to motivate and inspire people. That is a myth, say the authors. Praise, compliments, and appreciation do not do what people think they do. They do not unlock human potential. Fortunately, there is an alternative, acknowledgement.